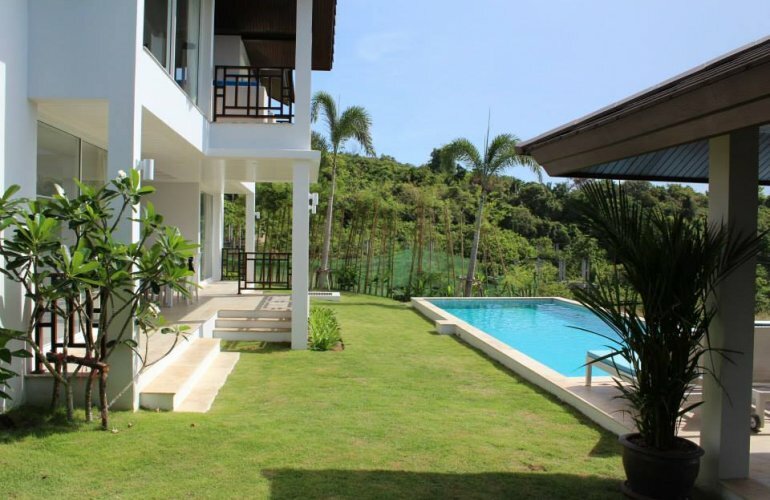 This stunning villa in Choeng Mon is the perfect choice for a Koh Samui retreat. The bright and airy property offers exceptional accommodation spread over two storeys, with immaculate open-plan living space, 3 en-suite bedrooms, swimming pool, landscaped gardens and spectacular views over the bay and the ocean beyond. Located in a secure and gated development just a few minutes from the beach this charming Samui holiday rental is elegantly furnished and generously proportioned with space to sleep up to 6 guests. Easily accessed from the airport and with plenty to do nearby this home is an ideal choice for families and small groups. From the first floor entrance the interior opens out into a stylish living and dining area with contemporary kitchen and generous furnished balcony. The living room features sophisticated and comfortable furnishings with a modern entertainment system and bright nautical accents throughout. Floor to ceiling windows perfectly frame spectacular views over the bay and islands beyond. A generous dining area boasts an impressive tiled feature wall, floor to ceiling windows, modern artworks and a heavy wooden dining table with seating for up to six guests. This is served by the fully-equipped kitchen featuring white units, marble worktops and a range of modern appliances. The living area opens out onto a spacious palm-fringed balcony with comfortable sofa seating, Bali-style side tables and breath-taking sunset views. The superb master bedroom is also located on the first floor, with king-size bed, stylish furnishings, floor to ceiling windows and stunning island views. The impressive en-suite bathroom opens out onto the bedroom allowing for uninterrupted sea views from the large bath with plenty of room for two. A smooth wooden staircase leads down to the ground floor with two further en-suite bedrooms located on each side of the home. Both rooms are finished to exacting standards with smooth terrazzo floors, traditional artworks, stylish accents and slide away doors leading out to the sun terrace and gardens. One room features a king size bed; the other features twin beds. Both rooms include excellent en-suite shower rooms. To the outside of the property lies a large stone-tiled sun terrace with sun loungers, seating and an alfresco dining area. Stone steps lead down to the villa’s immaculately landscaped gardens and large infinity-edge pool with luxury poolside loungers, a shaded pool sala and shower. The stunning outside space rolls effortlessly into the blue beyond for an enchanting effect. The exclusive Choeng Mon area boasts a series of exquisite bays featuring soft sandy beaches, crystal clear seas and miles of lush tropical foliage. The area is famed for its quiet, clean waters, upmarket resorts and excellent water sports activities.